This property does not offer direct subsidy but offers income and rent restrictions to low income households. For example, a single person qualifying for a 25% 1-bedroom unit could have a yearly income up to $15,450 and rent would be $411, but if the applicant's income is over $15,400--up to a maximum of $30,900--that applicant would qualify for a 50% unit and their rent would be $770. Family size must be appropriate and WSHFC income and eligibility approved in order to occupy specific-sized units.We accept Housing Authority provided Section 8 vouchers. 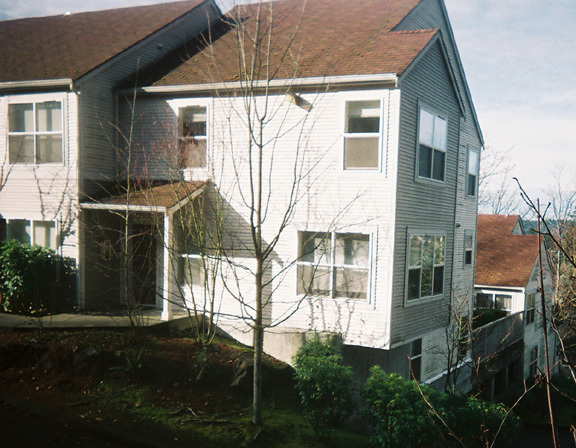 1, 2, 3, and 4-bedroom, small complex of 24 units on the hillside just east of Factoria Mall in SE Bellevue. .
Close to shopping, schools, freeways, buslines. Units are modern, spacious, and beautiful. Most units are fully accessible for wheelchair. Income Limit Details: Household annual income must be below 25% and 50% of area median income. Set-asides of 25% and 50% of market-rate apply. King County Maximum Income chart used as guide for qualifying applicants. Rent Detail: This property does not offer direct subsidy but offers income and rent restrictions to low income households. For example, a single person qualifying for a 25% 1-bedroom unit could have a yearly income up to $15,400 and rent would be $411, but if the applicant's income is over $15,400--up to a maximum of $30,800--that applicant would qualify for a 50% unit and their rent would be $769.